[SatNews] After a journey of more than seven billion kilometers that has taken more than ten years, space probe Rosetta is now approaching the finish line: The probe is scheduled to reach its quarry—comet 67P/Churyumov-Gerasimenko—on August 6th. At that point, the European Space Agency ESA’s 1.3-billion-euro mission will make comet history. Never before has a comet been as elaborately explored—and in such detail—as the Rosetta mission is poised to do. RUAG Space played a vital role in making this project happen. Rosetta is not only the first space probe to enter orbit around a comet, it is also carrying a lander that is to become the first craft to put down on a comet in the history of space travel. 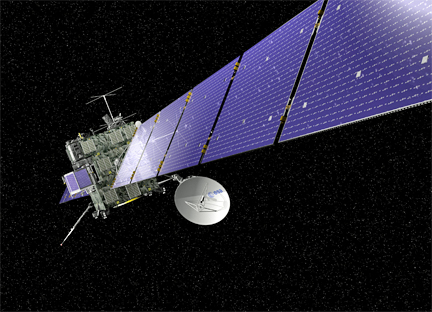 Artistic rendition of the Rosetta spacecraft. Image is courtesy of the European Space Agency (ESA). Rosetta took off on board an Ariane rocket on March 2, 2004. The probe spent a portion of its long journey in a form of hibernation, during which the spacecraft conserved energy by powering down all on-board systems as much as possible. Given that Rosetta’s flight path took the probe so far out into space that its solar generators could produce hardly any electricity, this was a necessary move. To prevent Rosetta from freezing, RUAG Space developed a special “sleeping bag” for the orbiter—a form of double insulation that offers effective protection from small meteorites as well as from the cold. Composed of more than 20 layers of metallised plastic film, this protective shield has the same insulating power as a brick wall more than ten metres thick. On January 20th of this year, Rosetta’s central computer, also built by RUAG Space, woke the probe up out of hibernation. By August 6th, the probe is expected to have almost caught up with the comet and will carry out the last of a total of ten, course-corrective maneuvers. Under the influence of the comet’s gravity, Rosetta will then enter into orbit around the comet. The lander is scheduled to put down on the surface of 67P/Churyumov-Gerasimenko sometime in November. The plan is for Rosetta to spend around a year and a half circling and examining the comet, and scientists expect its findings to provide new insights into the birth of our solar system. Comets are cosmic freezers that contain matter preserved in virtually the same state as when the solar system began over 4.6 billion years ago. And in having carried organic matter to our planet, comets may even have contributed to the beginnings of life on Earth. Rosetta is equipped with 11 scientific instruments. One of them, the Rosina (Rosetta Orbiter Spectrometer for Ion and Neutral Analysis) instrument, features a high-resolution mass spectrometer that was developed and built by RUAG on behalf of the University of Bern and goes by the name of DFMS (Double Focusing Mass Spectrometer). Rosina’s job will be to investigate the composition of the comet’s thin atmosphere and ionosphere. In addition, Rosina is equipped to determine the speed and temperature of the gases escaping from the comet. RUAG Space also developed the control and measuring electronics for another of the instruments, Midas, which will measure minute dust particles in the comet’s tail. To ensure seamless communication between the Earth and the probe, Rosetta was fitted with a high-performance communications system. RUAG Space manufactured this system’s high-gain antenna complete with cabling as well as the antenna’s pointing and deployment mechanisms.